If you have hard water at your home, then you’re no stranger to the nasty, white or brown spots covering your sinks, tubs, and glass shower doors. Unfortunately, these unsightly stains can appear anywhere that water is used. If the hard water deposits aren’t quickly addressed, the minerals in the water can penetrate the surfaces in your home, making it extremely difficult to remove. 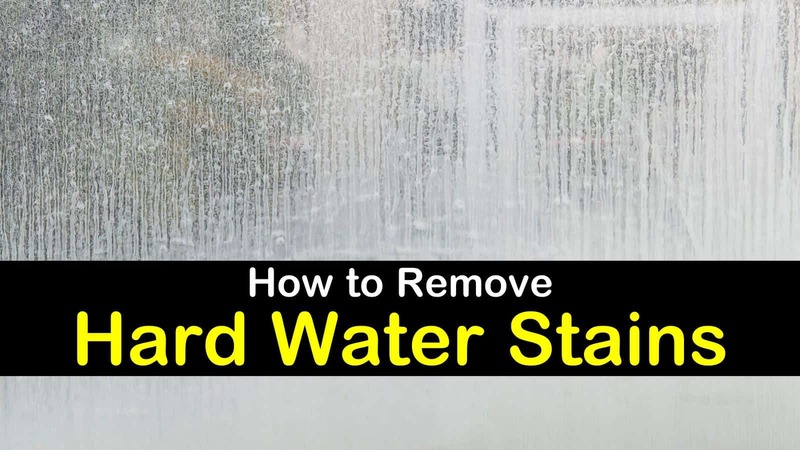 If you are frustrated by the stains left by your hard water, learn how to remove hard water stains from the surfaces around your home. When water has a high concentration of dissolved minerals like calcium and magnesium, it’s is called “hard water.” Water is first and foremost a solvent, which means it quickly picks up impurities. As water moves through the ground, it picks up small amounts of minerals. The degree of hardness increases as the levels of magnesium, calcium, and other minerals and trace elements increase. While hard water isn’t bad for you, it is a pain to address the stains on your surfaces that are left behind. Stains from hard water often form on the glass after the water has evaporated on the surface. As the minerals in the water dissolve, they leave behind white, cloudy, hard water deposits that can be a challenge to remove with a regular glass cleaner. Fortunately, there is a simple, all-natural and inexpensive glass cleaner recipe that can effectively remove hard water stains from your glass. In a spray bottle, combine the water and the vinegar. 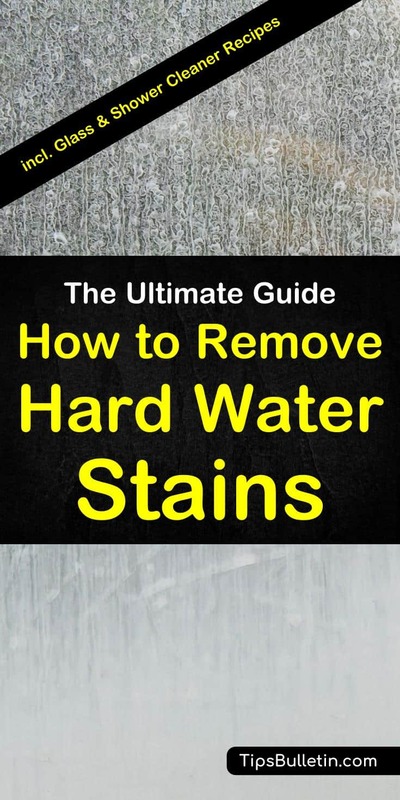 Spray the solution directly on the hard water stains. Let the solution stand for 15 minutes to allow the acetic acid in the vinegar to penetrate and dissolve the mineral deposits. Using a soft-bristled brush, gently scrub the remaining deposits. Wipe any of the cleaner residue from the glass using a damp sponge. Dry the glass with a clean, soft cloth or rubber squeegee. Sometimes the water from your sink or a sprinkler can cause stubborn hard water spots on your windows. Unfortunately, many of the commercial cleaners aren’t able to eliminate the stains. Removing hard water stains from your windows can be done without the use of harsh chemicals simply by making your own window cleaner. All it takes are a few natural ingredients that you probably already have at home. In a large plastic container or bucket, add the vinegar, baking soda, ammonia, and water. Stir thoroughly to combine. Dip a soft-bristled brush in the cleaning solution. Gently scrub the stains until they are eliminated. Rinse the cleaner from the glass and dry the area with a soft cloth. Hard water can quickly build up in your toilet bowl, leading to rust and scale stains that are not only unsightly but extremely difficult to remove. While there are many commercial cleaning products on the market, they aren’t as effective as the natural cleaners that you can make using inexpensive everyday ingredients. Here a simple natural toilet cleaner for tough water stains. Pour one cup of vinegar in the toilet bowl and stir using a toilet brush. Allow the vinegar to stand for one minute. Add the baking soda to the toilet bowl, followed by another cup of vinegar. Allow the cleaning solution to stand for ten minutes. Using the toilet brush, swish the solution around the bowl to ensure that it covers the entire bowl, including above the water line. Let the vinegar and baking soda solution stand overnight. In the morning, scrub the stains away. Hard water deposits can quickly make your bathtub look nasty and unclean. Just like with the toilet, hard water can leave an unsightly ring-like deposit in your tub. If you try to remove these stubborn stains with a commercial cleaner, you may be disappointed, because the hard water deposits can affect the cleaning ability of these products. Instead, eliminate limescale and other hard water stains with this simple DIY cleaner. Pour the white vinegar into a small spray bottle. Spray directly onto the stain, completely covering it. Allow the vinegar to sit for 30 minutes. Next, combine the table salt and baking soda and add enough water to create a paste. Dip a clean, damp sponge into the paste and apply it directly to the vinegar. Gently scrub the area until the hard water spots are eliminated. Rinse thoroughly with a wet sponge. Polish the glass with a soft cloth. Your shower sees a lot of action every week, which can be problematic when it comes to keeping your shower doors free of hard water stains. Cleaning your clogged shower head and shower doors with a damp sponge or using commercial glass cleaner, isn’t enough to get rid of the mineral deposits left by hard water. If you don’t want to use harsh chemicals on your shower door, try the following recipe from our homemade shower cleaners post to get your doors clean without using a commercial cleaner. Cut the lemon in half and rub it over the affected areas to help loosen the hard water spots. Combine the baking soda and vinegar to form a thick paste. Rub the paste over the spots to loosen the mineral deposits. Rinse the area to remove any residue and immediately towel dry to keep the spots from instantly reappearing. Water stains are one of the most common sources of stains to mar a beautiful granite countertop. If you find that hard water stains have marred your granite, you can safely eliminate them with the help of a few simple ingredients that you can find in your pantry. Combine the ingredients to form a thick paste. With a soft brush, gently scrub the paste over the stain. Thoroughly rinse the area with clean water. Wipe dry with a clean cloth. It may take several attempts to eradicate the stain. Overtime minerals build-ups as a result of hard water can damage the surfaces around your home. It can leave your silver and chrome looking gray and dull and can make soap scum even harder to remove. Fortunately, you don’t have to live with these unsightly spots. With the help of a few inexpensive, all-natural ingredients that you probably already have at home you can eliminate hard water stains and keep the surfaces around your home clean.